A version of this story appears in the January 12 issue of Sports Illustrated. From a few yards away, near the doorway with its number 87 welcome mat, the real Gronk’s laugh—“huh, hut, huh, hut”—sounds like a quarterback pleading for a snap. The man at the top of the driveway is actually Robert Goon (really), who along with being a friend and confidant serves as Gronk’s contractor, dishwasher, airport chauffeur, security guard and roommate. Let’s be perfectly clear: Rob Gronkowski, still only 25, is not a paragon of maturity and conformity. He wasn’t suddenly transformed by the thoughts of career mortality that came with the six surgeries that forced him to miss 17 games over the 2012 and ’13 seasons. When asked if he has considered what he would do after football, Gronk hesitates and says, “No.” From the other side of the house, Goon screams, “MINI GOLF!” If you need more proof that Gronk is still Gronk, take a look at the new Entourage movie trailer, in which his beer-funneling skills are on full display. As the Sinners Bus demonstrates, Gronk is simply partying smarter. They’re celebrating with him all around New England. 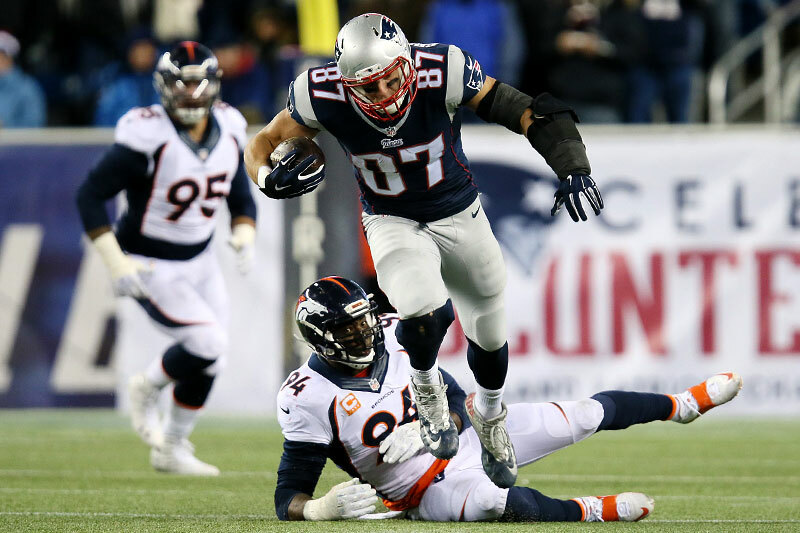 Gronk looms as one of the most important players in the 2015 NFL playoffs, thanks to a comeback from ACL and MCL tears that defied medical norms. 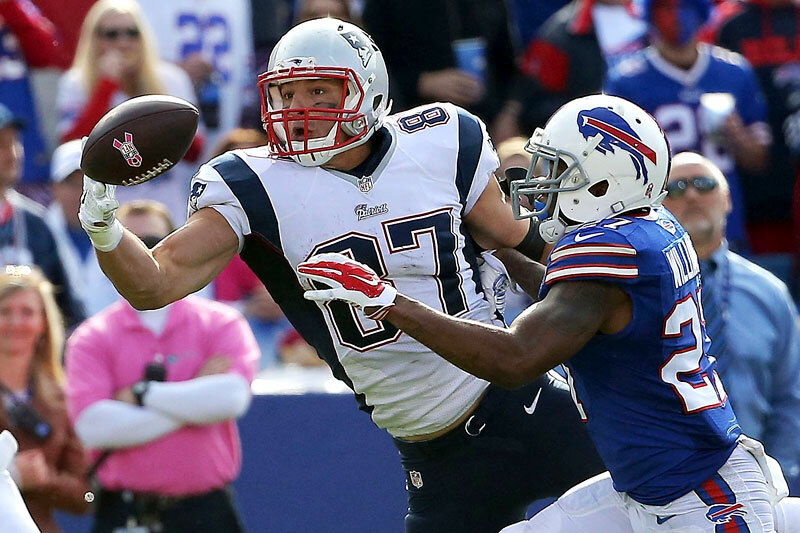 Gronk’s return resulted in 82 catches this season; his 1,124 yards and 12 touchdowns led all NFL tight ends. And with New England clinching home-field advantage through the AFC title game, having Gronk in full health—he played 15 games this season, missing only the meaningless Week 17 loss to Buffalo—and MVP form entering the playoffs for the first time since ’11 could well mean the Sinners Bus ends up pulling into Glendale for the Super Bowl. The last time we saw Gronk playing consistently at this level—requiring double teams, dragging three defenders through the red zone and flummoxing opposing coordinators—was in 2011. 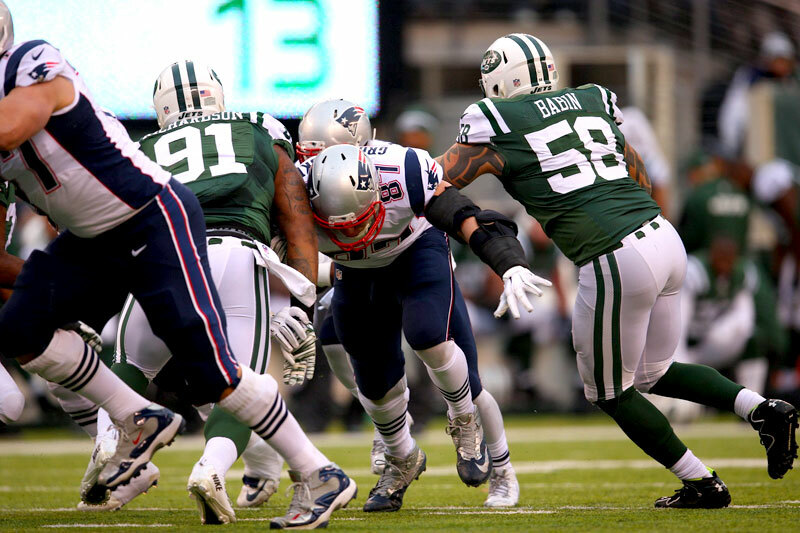 The Patriots predicated their offense that year on Gronk and Aaron Hernandez, and the second-year tight ends dominated all the way to Super Bowl XLVI. The Patriots lost to the Giants in that game, but everything changed for Gronk during that season. His name became a verb (“You’ve been Gronked!”) and his quips (“Yo soy fiesta”) landed on T-shirts. Something as simple as going to dinner in Boston’s North End became such a chore that his teammates stopped inviting him to avoid the inevitable scene. He understood. The moment Gronk morphed from NFL star to TMZ target can be traced to October 2011, when adult film actress BiBi Jones tweeted out pictures of herself and Gronk, who was wearing his goofy grin and no shirt. Jones revealed later in a radio interview that Gronk requested she tweet out the picture so he could get more Twitter followers. (She had about 100,000 and he fewer than 60,000; he’s now up to 672,000.) 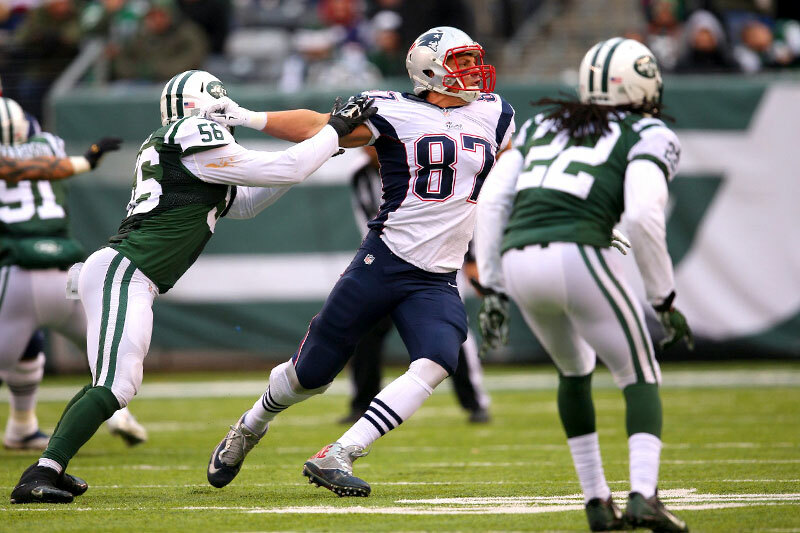 The incident exhibited Gronk’s most enduring and endearing trait: his simplicity. 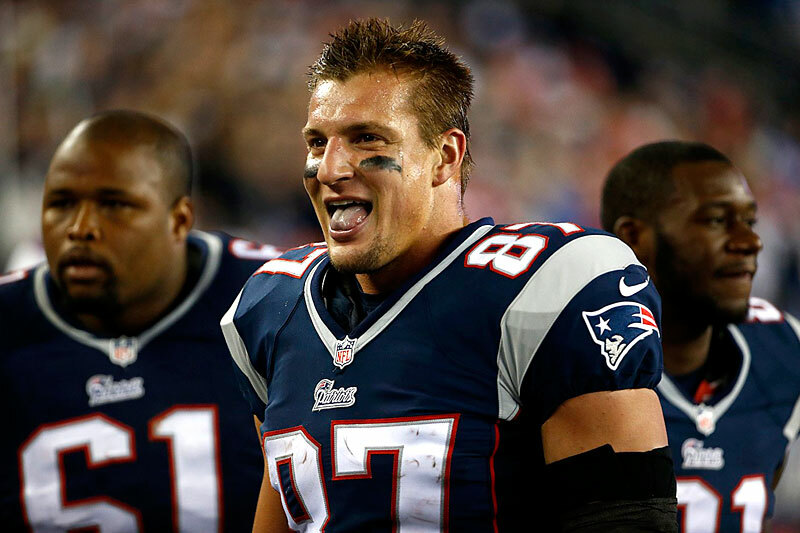 As Gronk’s profile rose, his core personality remained entrenched in the FGK House. That’s the four-bedroom faux frat house in Foxborough where Gronk lived during the 2011 and ’12 seasons with linebacker Dane (Freshman) Fletcher and journeyman linebacker Niko Koutouvides. Defiantly unrefined, they duct-taped the initials FGK (Fletcher, Gronkowski, Koutouvides) to the living room wall like fraternity letters. “[Gronk and I] were into the same things—girls and hanging out and having a good time on top of football,” Fletcher says. Gronk worked harder than he partied, something his friends insist got overlooked as his public image evolved into its Zubaz-clad, shirtless, dating-show phase. On road trips Gronk would arrive at the team hotel and go into a plank pose—a taxing yoga posture—for long stretches. He’d cook broccoli or mixed vegetables with almost every meal. Former Patriots offensive coordinator Bill O’Brien recalls Gronk’s consistently running 30 or 40 extra routes with Tom Brady after practice. “He’s one of the hardest-working guys I’ve ever been around,” O’Brien says. The daily glee that Gronkowski brings to the office is in powerful contrast to the depths he reached in 2013. In November 2012 he had broken his left forearm while blocking on an extra point play; then he broke the arm again in January. Complications that off-season, including an infection that required surgery, delayed his recovery and forced him to miss the first six games of the 2013 season. He was playing in his seventh game that year when another major injury struck. 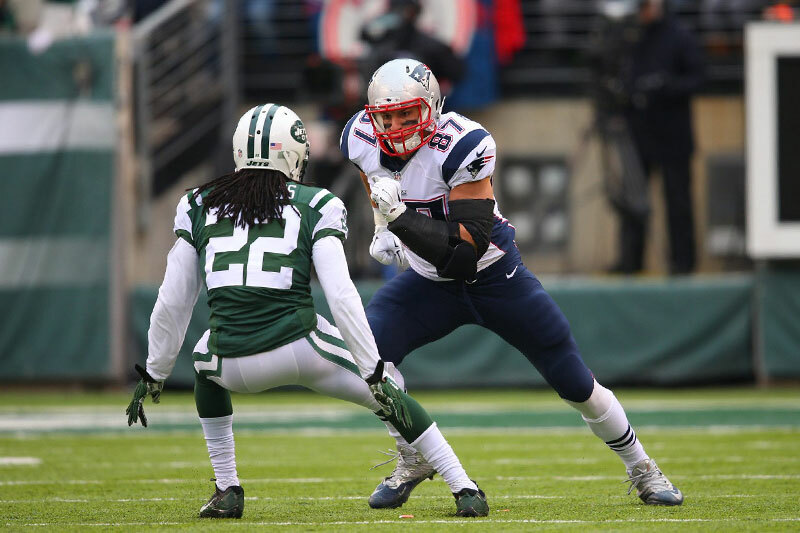 Against Cleveland on Dec. 8 Gronkowski charged upfield after catching an over-the-shoulder pass from Brady. 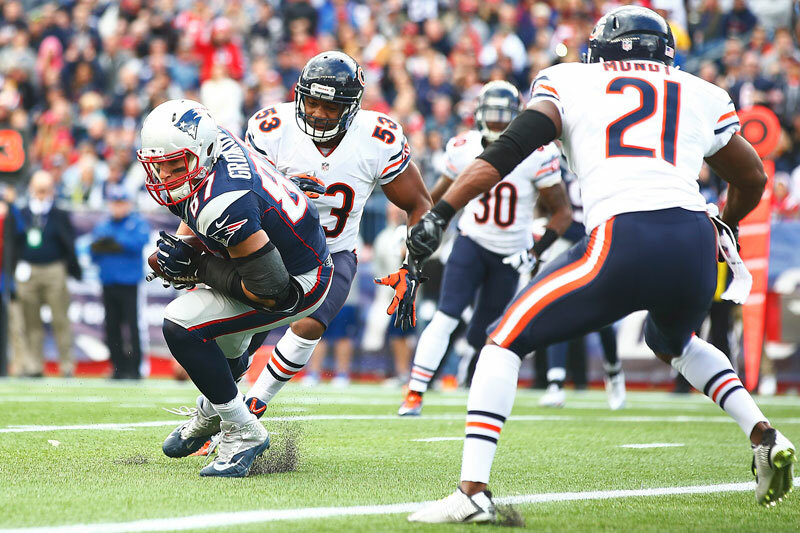 Browns safety T.J. Ward’s left shoulder pad collided with Gronkowski’s right knee with such force that it spun the 6-6, 265-pound tight end around like an Olympic diver, his head smashing into the turf so hard it knocked him unconscious. When he awoke to see his parents and the Patriots’ training staff in the locker room, Gronkowski learned he had a serious injury, later diagnosed as a torn ACL and MCL. He recalls thinking, Why is this happening again? Why me? 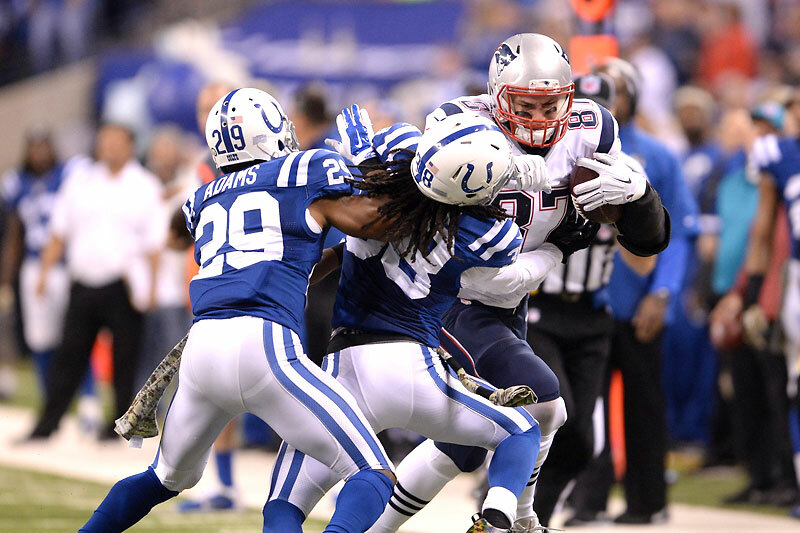 Gronkowski needed to wait a month for the swelling to subside before having surgery. 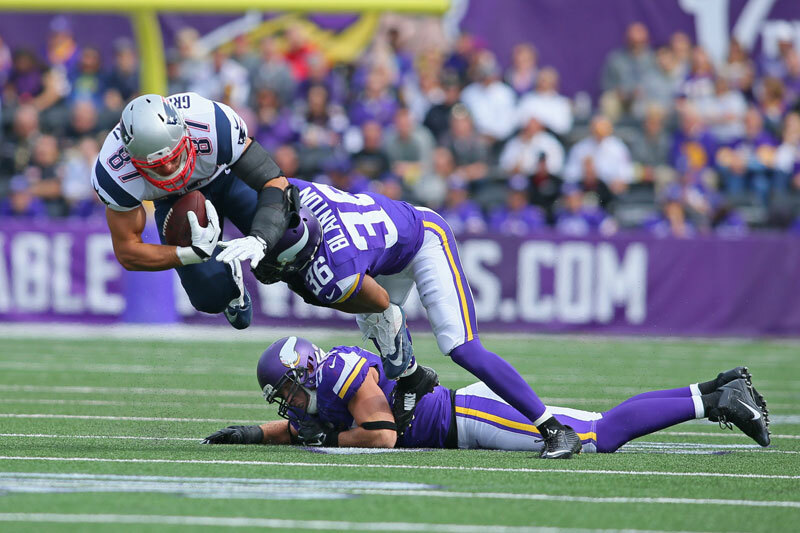 The day after the operation he looked at physical therapist Ryan Donahue and asked, “Am I ever going to play again?” Gronkowski had undergone five surgeries the previous two seasons, four that stemmed from the broken arm and one, in June 2013, to repair a herniated disk in his back. But those injuries did not compare in recovery time, rehab and career-threatening scope to the knee injury. 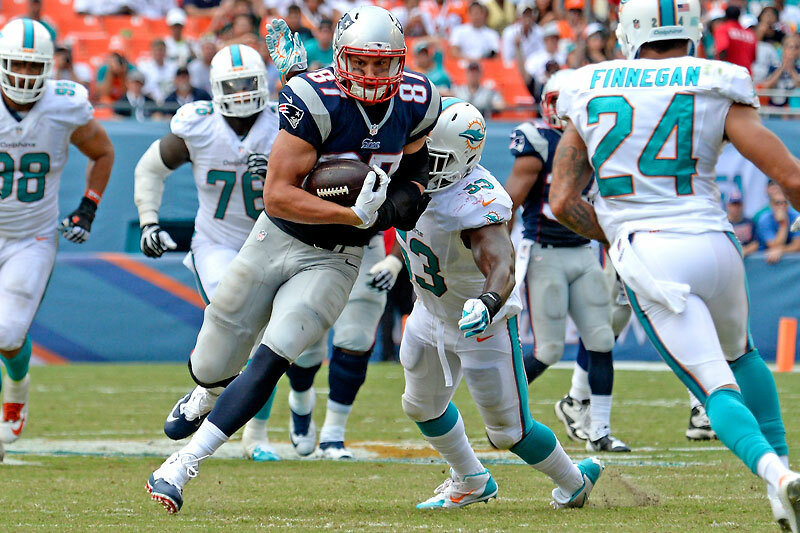 Gronk’s comeback was fueled partly by his work ethic and partly by genetics. Donahue rehabbed Gronk at the Andrews Institute in Gulf Breeze, Fla., for two weeks postsurgery and was so dumbfounded by how little Gronkowski’s quad muscles had atrophied after the operation that he pulled aside legendary surgeon James Andrews to show him. Gronk also brought an intense focus to each tedious rehab session, which began with quad-muscle flexes and then progressed to simple leg lifts. Five or six days into his rehab, Gronkowski began trending back toward his usual puppy-dog optimism. He worked up to reps on a recumbent bicycle and soon requested a higher level, but Donahue held him back. 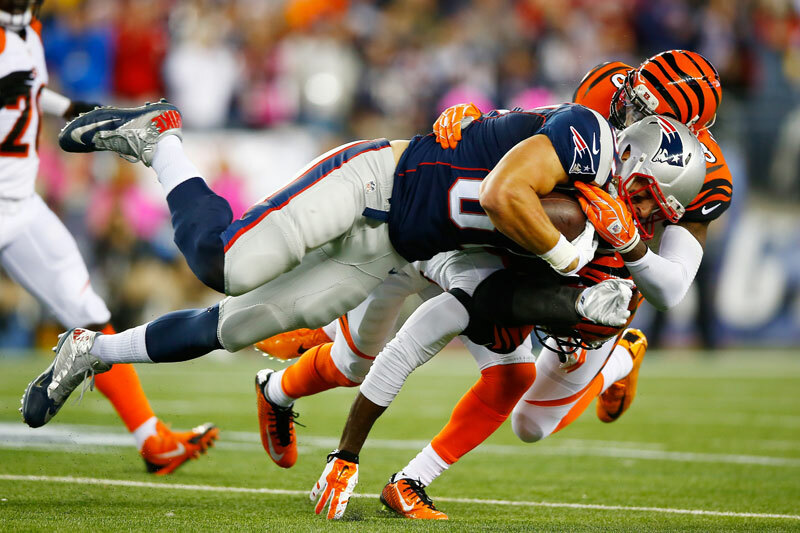 To challenge himself, Gronkowski curled 35-pound barbells while working his leg on the bike. “He felt like he had to earn everything, which I really admire,” Donahue says. When Gronkowski arrived for his predraft visit in New England, the Patriots simulated the team’s classroom experience. O’Brien and fellow assistant Brian Ferentz taught him blocking schemes, which Gronkowski absorbed and then demonstrated after ripping off his coat. “We were laughing our asses off, he was blocking the hell out of us,” says O’Brien, now the Texans’ coach. By the end of the meeting, Gronk’s yellow dress shirt was untucked and stained with marker from the grease board. And the Patriots were sold, trading up to get him in the second round, one of Belichick’s shrewdest moves. Since New England fully integrated Gronkowski into its offensive game plan in Week 5 against Cincinnati this season, the Patriots’ offense has averaged 34.5 points per game (excluding the Week 17 finale when Gronk rested), compared with 17.8 when he was out or limited. Brady compliments Gronk’s improved understanding of coverages and his ability to make “adjustments to adjustments to adjustments.” Tight ends coach Brian Daboll says Gronkowski sees coverages from corners, linebackers and safeties, depending on the opponent. Don’t be surprised if that problem child reappears in the Super Bowl, Sinners Bus and all. And don’t be afraid to jump aboard and crack a beer. After all, Goon is driving.